(Nanowerk News) Dr Daniel Tan, from the University of Sydney's Faculty of Agriculture and Environment specialises in developing heat tolerant crops. "Heatwaves can cause major crop failures, such as that of the American corn crop last year after consecutive days of soaring temperatures in the Midwest," Dr Tan said. In Australia crops vulnerable to heat stress include wheat, chickpea and cotton grown in the nation's grain belt region. Dr Tan and his team are developing heat resistant strains of these three crops. 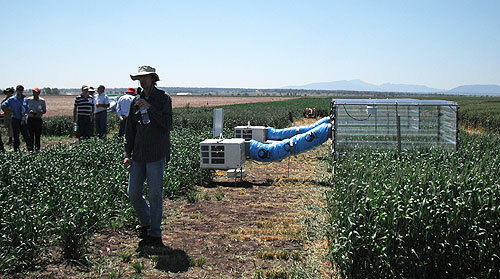 The researchers used field chambers - boxes that simulate heatwaves - for their tests. "Heat means not only a reduction in the amount of crop harvested but its quality. In wheat the effect of intense heat includes a reduction in the protein quality of the grain that is harvested. In the case of chickpeas they can become sterile when heat stressed," Dr Tan said. Together with a team of PhD students and international collaborators, Dr Tan has started a program to develop Australian crops that can resist heat by using natural variations in crop genetic collections from around the world. "We work with countries where these crops originated, for example America for cotton, and institutions where varieties of genetic crop seeds are held," said Dr Tan. The material is tested for heat tolerance in a range of locations. Wheat varieties are tested in Australia, Mexico and, because of the potential consumer market there, China. The tests include searching for cotton varieties which can photosynthesise successfully at high temperatures and chickpea strains that can pollinate in very hot conditions. "While we are concentrating on crops grown in Australia our work has obvious implications for agriculture worldwide given the documented trend of rising temperatures. The vulnerability of these crops, which feed millions of people, means our work has global relevance," said Dr Tan. The researchers are looking for naturally occurring heat-resistant variations in crops so they can release them to farmers immediately, without the technical and bureaucratic complexities of producing a genetically modified crop. In June last year Dr Tan and his team were awarded a $1.8 million Grains Research and Development Corporation grant to develop new strains of heat tolerant wheat, concentrating on the northern grain region in Narrabri. This project uses field chambers - large plastic boxes in which reverse cycle air conditioning simulates a heatwave - to test crops at different stages of development, especially just before pollination and at the flowering stage.